Please refer to our stock # tc10086 when inquiring. This is a 17 inch Sterling Silver necklace with a spring ring closure. 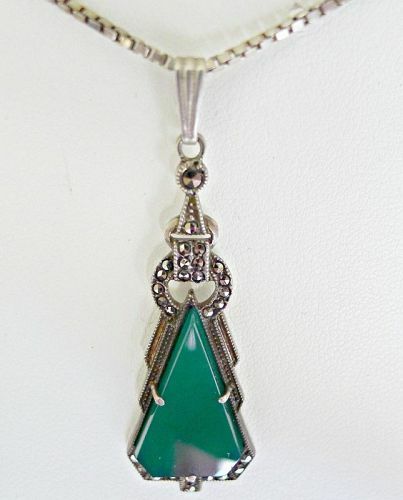 The pendant is a tad less than 2 inches long and is jadite glass decorated with sparkling marcasites. It is an exquisite necklace and very sparkly when worn. The pendant is marked sterling, as is the chain - however I am not sure the chain is original to the pendant because next to the spring ring is a silver mark and also what appears to be Vendome. If it is Vendome it is newer than the pendant. However, they look perfect together and both the chain and the pendant are in excellent condition.